The Square-Enix of 2013 is almost unrecognizable from the Square-Enix of yesteryear, and it is completely unrecognizable as the once powerful and prolific Squaresoft. Go to the show floor at E3 and the big games on its screen are named Final Fantasy and Kingdom Hearts, just like the good old days, but it’s all a façade. The most promising games published under the company’s banner aren’t from its faded Japanese studios, but its western partners formerly of publisher Eidos. Chief among those new developers is Eidos Montreal, whose brilliant 2011 action RPG Deus Ex: Human Revolution remains one of the best games to bear the Square-Enix name in years. 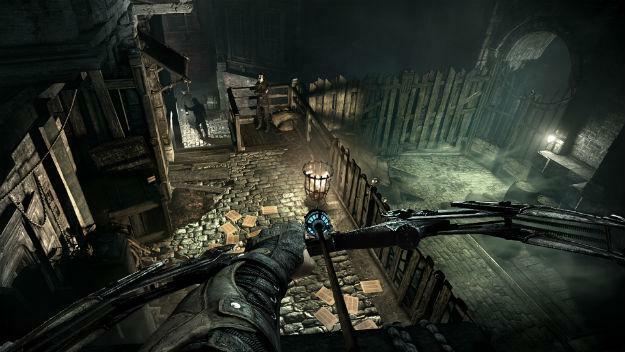 That studio is back with another reimagining of a classic action RPG series in Thief. This E3, Square Enix was showing off a hands off, playable demo of the game (played for us by a developer). Digital Trends sat down to look at Eidos Montreal’s first next-gen game. The Heart and the Riot. Garret, the master thief that starred in Thief: The Dark Project long ago, returns as the lead in Eidos Montreal’s take on the series. He burgles in a vaguely Victorian, imaginary metropolis known simply as “The City,” which is ruled with an iron fist by The Barron. 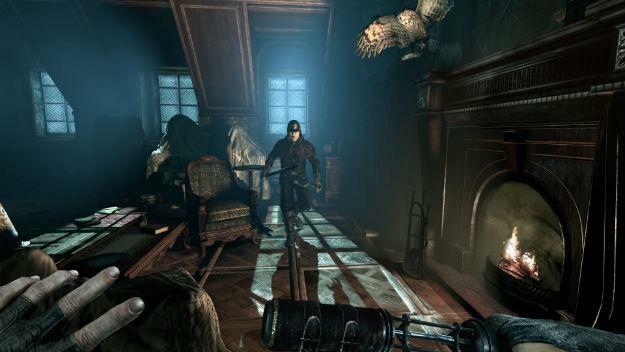 When Garret sneaks into The Barron’s mansion in Eidos Montreal’s E3 demo of Thief, the people of the city are rioting, burning buildings down in protest against The Barron. But while the people demand liberty, Garret’s just there to steal the “Heart of the Lion,” an artifact secreted away in a hidden room at the top of the mansion. Problem is, there are guards, traps, and other obstacles in his way. Plus, he doesn’t even know what it looks like. A (Dis)honorable thief. The set up in the demo is mostly a good excuse to demonstrate the game’s stealthy action. While the milieu may sound similar to last year’s Dishonored (which itself was inspired by the old Thief), it’s much more like Deus Ex: Human Revolution in execution. Garret can get to the Heart of the Lion by sword and archery if he so decides, fighting his way there, but he can also sneak through, climbing up the slick masonry of the mansion and through the sewers below. When he climbs, though, or when he subdues enemies, the first-person action shifts to third-person, just like Human Revolution. Pickpocketing is even the same. The hacking style mini-games have been replaced with others like lock picking, but they fill similar roles in pacing. Thief is distinct, though. Go high or low. The environments are far more open compared to Deus Ex’s cramped interiors, and Garret’s tools and skills are more specific than Adam Jensen’s big bag of guns and grenades. There are ice arrows for dousing lanterns and rope arrows for climbing up into rafters. Having access to multiple routes to your goal remains the same, though. The person playing our demo could have climbed up to the hidden room from the outside, but opted for the more guard-heavy way through the library inside. This served only to show how much tinkering the game still needs, however, as a guard completely ignored being hit in the face with a sword as the AI went to look at his knocked out companion. Coloring your view. 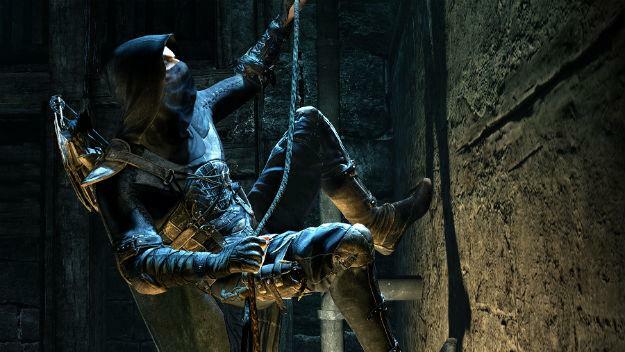 Truth to tell, Thief may not be the best candidate to demonstrate the power of next-generation consoles. The PC build demoed for us betrayed the game’s roots as a title that went into development in 2009 with the current gen firmly in its sights. The dark, dingy mansion and its grounds lacked much of the character in the gold-tinged Deus Ex. At the end of the demo, though, when the mansion and massive bridge to it started to burn and crumble at the edges, the spectacle of Thief went from dour but competent, to spectacularly oppressive. The roof is on fire. Garret needs to run through the grounds as he escapes, with the flames licking at his heels every which way. It feels scripted, with the buildings falling apart at key moments, but the smoke and fire are realistic and scary. There are also neat challenges within, like treasure in a locked box that you have to be speedy enough to open before the house literally burns down. Other remarkable visuals include a building literally turning on its side, and seeing all the furnishings tumble over, forcing you to find a new way out. 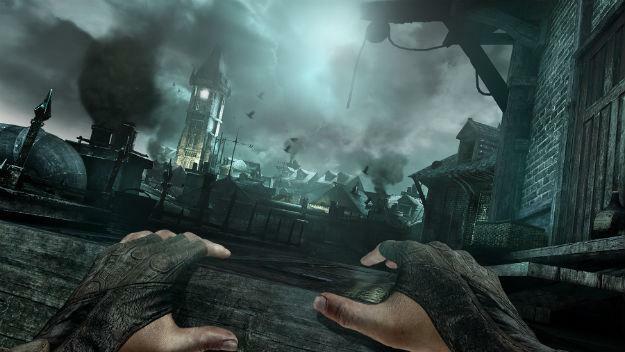 Like Deus Ex, Eidos Montreal’s Thief is wasted on a demo. These action RPGs are about building a vast world and making choices within it, not running through a room. The game looks promising, though, and it has impressive options for the devoted player. Visual cues like red icons over alerted guards or the “Focus” mode which highlights everything you can interact with can be turned off completely for a more challenging, naturalistic experience. The game isn’t due out until 2014, so Eidos Montreal has plenty of time to smooth out the rough edges and potentially give its parent Square-Enix another hit.